New book, 561 pages. For over 150 years, from 1314 to 1485, England fought an almost continuous war with its neighbours: the Campaign of the North when the armies of Robert the Bruce were vanquished, the long 116 year conflict with France, finally imploding into a bloody civil strife in the War of the Roses. Too often attention has been placed upon the bravery of knights and archers during these conflicts yet face to face confrontations were few. Peter Reid proposes that England's ability to discipline, provision and finance such a long campaign was at the heart of its success. 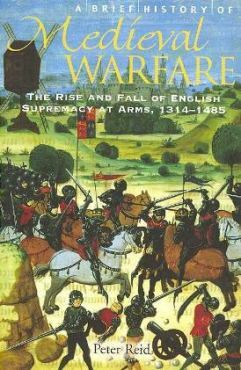 England was so strong because the whole nation was converted into a political state of total war. The campaigns were just won not on the battle field but in the organisation of troops and supplies. Interweaving his argument with a dramatic recreation of the main events of the campaigns, on land and at sea, Peter Reid presents a new perspective on the turning point in English history.